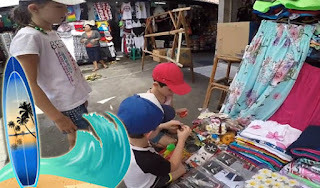 Kuta Art Market is located on Kartika Plaza Kuta Street. In the art market, every tourist can choose a variety of Balinese souvenirs and souvenirs. Starting from clothes with Balinese motifs, bed covers, sarongs, shorts, barong clothes, paintings and other art items. The distance from Kuta Beach is only about 100 meters. In fact, one of the beach entrances can be accessed from this market. According to information obtained, this art market has been established since 1965, this market has around about 250 art store. The stalls face each other, forming an aisle that is about one and a half meters wide. Kuta Art Market starts operating at 7:00 a.m. until 20:00 a.m. Since long ago this market has become a favorite shopping place for tourists who are on vacation in Bali. At Kuta Art Market you can see and buy various forms of souvenirs of Balinese characteristics. Starting from clothes with Balinese motifs, bed covers, sculptures, paintings, bags, knick-knacks and other items, everything is here. Due to its location near Kuta beach this market is always crowded with tourists both local and foreign. All items sold in this market have varying prices depending on the desire and bargain when buying.